Amazing how conditions can change over the course of 24 hours, even in the depths of winter. Although hardly tropical, Sunday was much brighter for a close encounter between Harrogate Ladies and Didsbury Toc H Ladies. I only discovered this fixture about an hour before it kicked off but I am so pleased to have made it to see this highly exciting and entertaining game. Quite significant also that it came so close to the end of the year as it brought back memories of a couple of 2018 highlights for ickledot. I’ve written before about Harrogate Rugby Club’s difficulties with drainage at their relatively new home. I can only assume on this occasion that it was Saturday’s torrential downpour which put the first team pitch out of action. The second pitch was used for practice and so once more we were back on the third pitch, the one which had provided some of my most memorable pictures of 2018. It was back in February when Harrogate played York RI. The ground was so wet and muddy that the two teams were virtually unrecognisable by the end. When Harrogate captain Rose Jay attempted to kick off at the start of the second half, the ball simply refused to bounce! Scrum half pass with the lettering displayed perfectly! The fixture also brought back memories of another match between the two sides, played at Barnsley Rugby Club on a much brighter and warmer spring day. This was a play off for promotion and possibly my most exciting and closely fought game of the year. You can read about it here. In the end, the two teams had been so far ahead in their respective leagues, it was decided to promote them both. So here they were, facing each other once more. Rose was not present to repeat her kicking off attempts. Several other key members of the squad were also unavailable. However, any nervousness regarding the absentees was quickly dispelled as Harrogate burst down the left to touch down in the corner. Have to admit I missed it all together as I was still trudging down the touchline to my place. Unfortunately there are no proper match reports available yet and you know my descriptions are never more than general or sketchy. Looking back, it seems to me that the course was set by that first try. 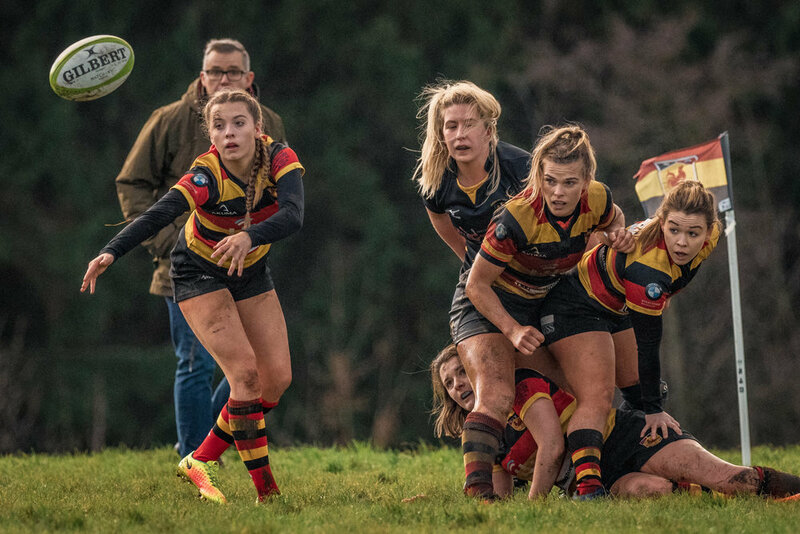 Though Didsbury fought hard as expected, they were never really able to put pressure on the home side not quell the Harrogate attack, whose pack was strong, forcing the play and providing at least a couple of tries. There was a constant threat also from the Harrogate backs, across the field on either flank. 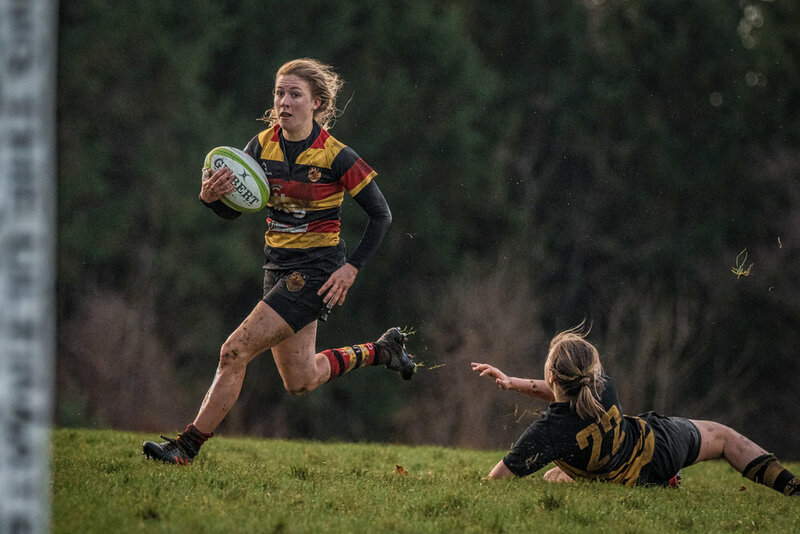 Lauren Bolger was unstoppable on the right, scoring one running try, virtually from her own half, in the first forty. She was on the scoresheet again in the second half, running onto a selfless pass from Simone Christopher. Down the left it was great to see Alex Wallace back in action once more. I first witnessed Alex’s strength and blistering pace when she was playing for West Park Leeds and Leeds Beckett University a couple of seasons ago. Shortly after she was selected for Yorkshire. Our paths also crossed when she played and refereed some Try Tag Rugby. Sadly it was not long after when she was injured and missed much of a season while recovering. Now she’s back and playing for Harrogate, which is great to see. On this day she scored at least one try and was a worry for Didsbury throughout down the left. Have to be honest - Alex’s effort here was disallowed. Far more dramatic than my shot of the one she did score though! The final score was 32-10, a fair reflection of the play in ickledot’s humble opinion, particularly given Harrogate’s strong second half showing. Having witnessed Didsbury’s force back in April, perhaps it was just an off day for them or maybe they had personnel missing too. I’m sure they’ll come back strongly before the season’s out. Well done to Harrogate though. Onwards and upwards. As for the photography, it was better due to the increased light compared to the previous day. Never easy in winter though, and it was pretty murky near the end. You can see more pictures from the game here. Weekend of Woe: For Yorkshire, the Bees and Me!